If quotes like “Life is like Tetris; if it doesn't fit, just flip it over”, and “games don’t make you violent, lag does” resonate with the gamer that’s deeply coded within you, then this gamer evolution t shirt is going to suit you just fine while you own all opposition, whether it be Bots or any other mortal player who thinks he can challenge you. After all, you’ve been playing games since time immemorial, right since ‘they’ feared that Pac man would turn us all into pill munching people running around in dark rooms listening to repetitive electronic music. We know you would rather invest your time on your Play station or Nintendo over actual human contact, and we also know that you do believe that way too much technology and resources are being wasted on science and medicine rather than game development. We monkeys recognized quickly that as gaming continues to evolve and improve, with the flips and beeps of early Atari consoles evolving into the thousand-page scripts of the modern era, between now and then there have been millions of lines of dialog written, bringing our favorite characters to life via soundbites, speech bubbles, and dialog choices, all to bring you that virtual experience that makes it living worthwhile while subconsciously preparing you for a zombie apocalypse. 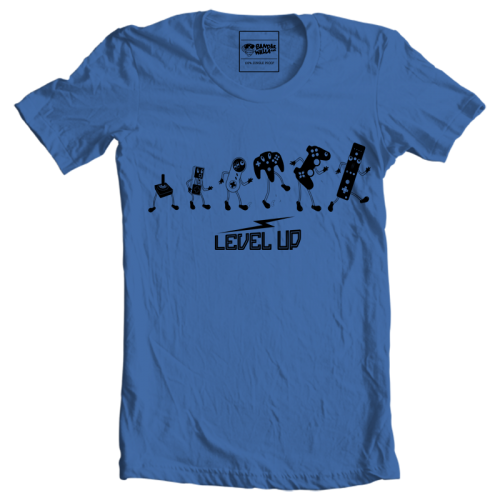 We understand that the keyboard alpha keys W,S,A,D or coloured buttons X,Y,A,B or the most easily recognizable X triangle, square and circle shapes have a special place in your heart, which is precisely the reason we bring you this gamer evolution t shirt which chronicles the evolution of gaming as we’ve known it, available online in an electric blue and a cool grey with the design having the words “ LEVEL UP” printed in classic gamer font.